National Tropical Botanical Garden is a nonprofit organization, headquartered in Hawaii. Within NTBG's holdings are four gardens and five preserves in Hawaii, and a garden in South Florida. The mission of the National Tropical Botanical Garden is to enrich life through discovery, scientific research, conservation, and education by perpetuating the survival of plants, ecosystems, and cultural knowledge of tropical regions. The institution has four gardens and five preserves in the tropics (Hawaiian Islands) and a garden in the sub-tropical area of South Florida. Special Collections:Today the living collections include plants from around the tropical world with a special focus on Pacific Island plants, particularly Hawaiian endemic and indigenous plants, rare and endangered plants, species from the Marquesas, American Samoa, Palau, and Micronesian islands like Kosrae, Pohnpei, and Chuuk. Other large collections include Zingiberales, Rubiaceae, palms, pandanus, cycads, Erythrina, a tropical fruit tree collection started by Dr. David Fairchild and the world’s largest collection of breadfruit. 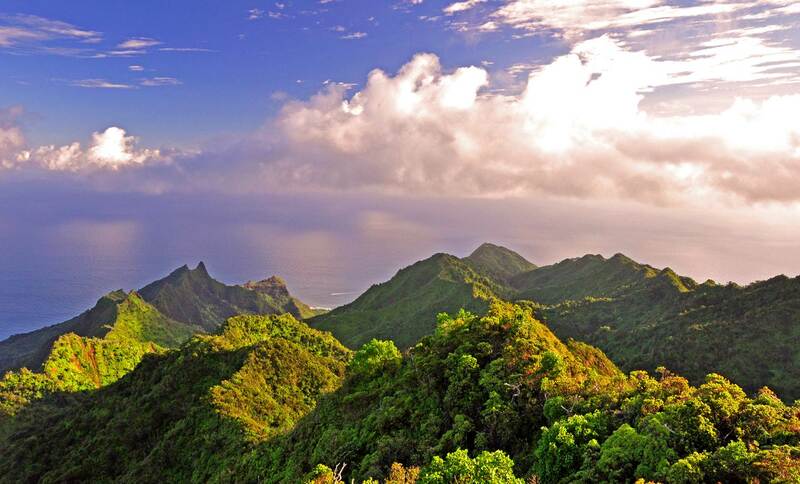 Many of Hawaii's ecosystems have become endangered as a direct result of human activities such as agriculture, timber extraction and construction. Introduction of feral pigs has had a devastating effect on the island ecology, destroying the tropical rainforest understory and allowing highly competitive alien species to gain a foothold. The National Tropical Botanical Garden (NTBG) manages the Limahuli Preserve which is located in one of the most biodiverse corners of the oldest Hawaiian high island, Kauaʻi island. The forest type ranges from lowland-mesic to montane-cloud forest, thus making it the second-most biodiverse valley in the Hawaiian Islands. Home to dozens of critically endangered plant and bird species, their ecological restoration work includes habitat protection, habitat restoration, as well as both in situ and ex situ conservation of rare plants. As a means of habitat protection, ungulate exclusion fences have been installed. One fence protects 344 acres of montane-cloud forest and the other 66 acres of lowland-mesic forest. These protected areas have been designated as sites for conservation collections of the rarest species in both of the respective ecozones. Given the habitat loss associated with feral ungulates and other system altering invasive plant species, Limahuli Preserve one of the most viable options for plant conservation because it is protected and has decades worth of work founded in science. With the fences and other infrastructure installed, and institutional support in place, NTBG are poised to create robust conservation collections of critically endangered plants that will make a substantial contribution towards conserving the genetic diversity of quickly-dwindling gene pools. Such collections will give these species the best chance of being equipped to evolve in the context of global climate change. For more information about this project please click here or contact Kawika Winter. At one time in Hawai‘i, dry forests occupied much of the leeward lowlands of all the main islands and were rich in native tree species. But they were nearly all eliminated by agriculture, livestock grazing, and development by the 1950s. Less than 10 percent of Hawaiian dry forests remain today as scattered remnants in only a few leeward sites across the state. On Kaua‘i the Lāwa‘i Forest Restoration Project run by NTBG is innovative and strategically significant By developing a dry forest restoration site, we are creating a habitat for at least 100 native plant species that can eventually be planted there. Many of these species are threatened with extinction and no longer have a viable home in the wild on Kaua‘i. 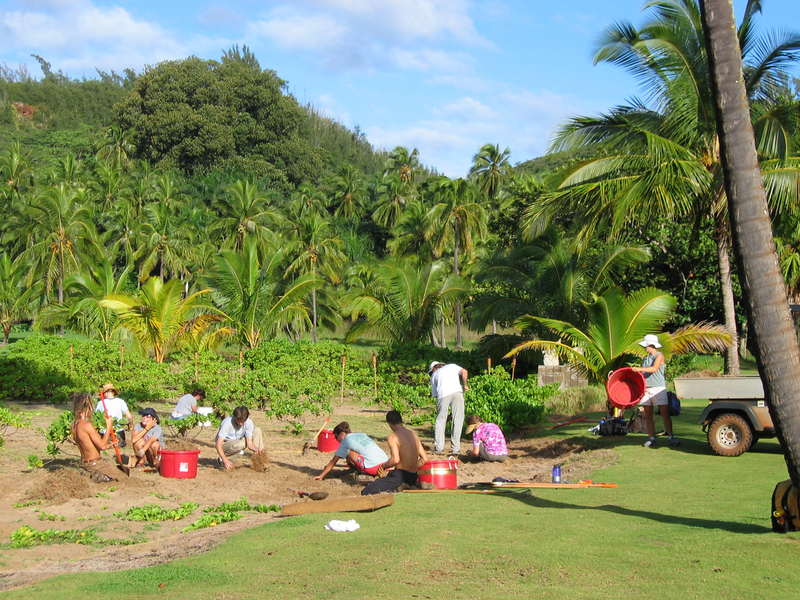 The site of this restoration project is located directly below the NTBG Headquarters on the west slope of the Lāwa‘i Valley. The site is approximately 10 acres. Introduced species of brush and grasses currently dominate the area. 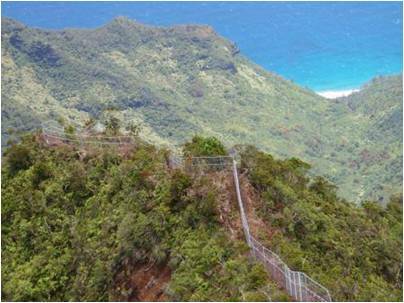 When completed, the restored site will feature three to four distinct dry forest types based on variations once found throughout Hawai‘i. We will achieve these variations utilizing Kaua‘i species only. The forest will contain mixed assemblages of tree species with individual species grouped in small stands. For more information about this project click here or contact Seana Walsh.